The Carnival 2016 programme of events was launched earlier today. 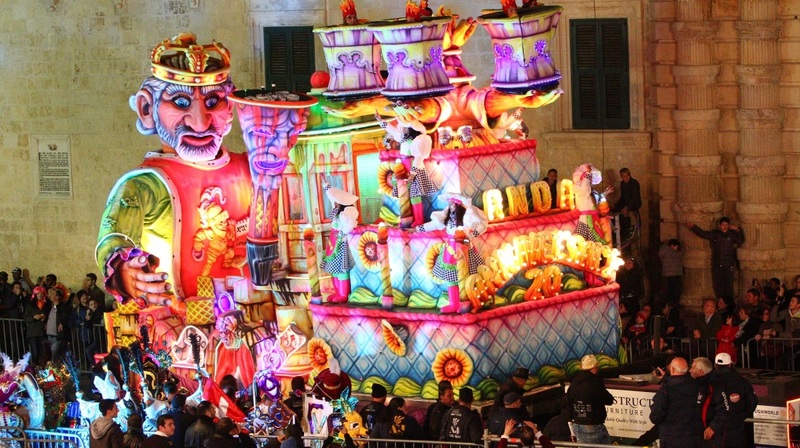 This year’s edition of Carnival includes a special float by Valletta 2018 to celebrate the city’s 450th anniversary. The float features several characters which have shaped our capital city, including historical characters such as Jean Parisot de Valette and Glormu Cassar, as well as contemporary architect Renzo Piano. Festivities this year will not be limited to Valletta but will also be organised in other towns and villages. A Carnival Band Parade will take place in Main Street Ħamrun on Sunday 7th February at 10am. This parade will involve the participation of three carnival floats including King Carnival, five bands, the Ħamrun Scouts Group, satiric grotesque masks and dance companies. There will also be an entertainment stage and a costume competition. Fourteen colourful floats and several grotesque masks will then proceed to Valletta to take part in the parade, which will leave Castille Square and proceed along Merchants Street, St George’s Square and Republic Street. An elevated platform is being set up at Castille Square, enabling wheelchair users and parents with young children in pushchairs to enjoy the festivities with ease. This was revealed earlier today, when the programme for this year’s carnival events was launched during a press conference addressed by the Minister for Justice, Culture and Local Government Dr Owen Bonnici, the Executive Chair of Arts Council Malta Mr Albert Marshall, Festivals Director Ms Annabelle Stivala Attard, Carnival Artistic Director Mr Jason Busuttil and the Chair of the Valletta 2018 Foundation Mr Jason Micallef. Once again, Carnival activities will include the recently revived qarċilla – a carnival farce going back to at least 1760 – which is led by a notary together with a bride and groom, their parents and witnesses. The qarċilla makes fun of contemporary society, using humorous suggestive verse. In this year’s qarċilla written by Immanuel Mifsud, a well-known Maltese author who has just won the National Book Prize with his novel Jutta Heim, a notary will proclaim the marriage between two men. Festivities which have become an essential and popular part of the Carnival calendar of events will be taking place as usual in the streets of Floriana and Valletta, with St George’s Square being the main focus of activity. These events include the grand défilé as well as competitions for floats and dancing companies. Audiences can also expect new elements which will be introduced in this year’s calendar. One such event will take place on Sunday afternoon at 14:30, when the show which will take place in St George’s Square will be accompanied by a live marching band. This event is being re-introduced to the festivities after an absence of 20 years. On Saturday evening, festivities will also continue into the night, giving merry-makers the opportunity to keep on celebrating. On Tuesday, the grand défilé will come to a close at 21:30. Other events linked to this national celebration will include an exhibition of miniature candy floats, which will also be the subject of a competition between confectioners and hotels. This exhibition can be viewed at Pjazza Teatru Rjal from the 4th to the 9th February. Seating will be available for events at St George’s Square. Tickets can be purchased online from www.ticketline.com.mt The event will also be covered live on TVM on Saturday morning, Sunday afternoon and Tuesday evening, giving those who cannot make it to Valletta the opportunity to get a glimpse of the festive and colourful atmosphere from home.